Youthful energy and rhetoric for change have seen Andrzej Duda transformed from a virtual unknown to the rising star of Eastern European politics – but his presidency could set Poland against Russia and the EU. On Sunday, 51.6 percent of the electorate cast their votes for Duda to replace the centrist incumbent Bronislaw Komorowski, with a turnout of 55.4 percent, according to the official results. Exit polls showed that over 60 percent of rural voters supported Duda, but only about 40 percent of those live in cities. 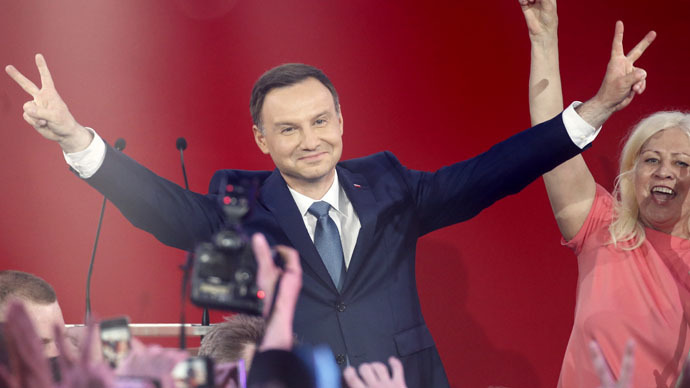 Like the last president from the Law and Justice party and Duda’s idol, the late Lech Kaczynski, who held the office from 2005 to 2010, the new Polish leader won by appealing to voters from the traditional heartlands – Catholics, social conservatives, farmers, and those left behind by Poland’s superficially stellar economic performance in the last decade. His promises have been wildly populist: Duda said he would lower the retirement age, which rose to 67 in 2012, raise income tax brackets, and force banks to turn lucrative Swiss franc mortgages into manageable Polish zloty ones, costing them billions of dollars in profit. Duda’s critics have dismissed his proposals as contradictory, unfeasible, and even illegal. Indeed, as president he does not have the power to ride roughshod over prime minister Ewa Kopaczand parliament, which is dominated by her centrist Civic Platform party, at least until autumn’s parliamentary election. His actual responsibilities for now will be mainly vetoing unacceptable legislation, and representing Poland at international meetings. However, it wasn’t only Duda’s wild promises that enabled him to defeat Komorowski, a popular politician with credentials as an anti-communist underground printer, but also the personality and spirit he brought to the campaign. Firstly, as the son of two academics, married to the daughter of a famous writer, and a former professor at Poland’s most prestigious Jagiellonian University himself, the suave, intellectual Duda does not have the same rough edges as the Kaczynskis, who could always be caricatured, however unfairly, as country bumpkins. As a 43-year-old, whose previous political experience consisted of a short stint in government almost ten years ago and a year in the European parliament, Duda, who has no Communist-era baggage, has credibility as an ‘outsider’ and successfully presented himself as a candidate for change, a word he used liberally in his campaign. In contrast, Komorowski, considered a shoo-in even after the first round of voting, canvassed complacently, while often sounding out-of-touch, entitled, and irascible. Meanwhile, his party, Civic Platform, which had been in power since 2007, is also evidently beginning to engender some voter fatigue regardless of its successes, such as hefty 3.5 percent economic growth rate this year, compared to rest of Europe which continues to trundle along. With the constraints of his role, and uncertainty about the rigidity of his ideology, it is not yet clear what, if any, impact Duda will have during his five-year term. Wary of being painted as an ideologue, and unwilling to resuscitate the divisive rhetoric of Law and Justice’s last government in 2005-7, Duda presented himself as a one-nation moderate during his stump speeches. “Each of us is a bit rational and a bit radical, but we need to look for shared values,” went a typical soundbite. However, beneath the image of a ‘reasonable man,’ lies a set of spiky beliefs. Civic Platform has treated touchy EU issues, such as migration, trade or industrial decline, as an inevitable and reasonable price to pay for a historic chance to join Europe’s leading bloc, but Duda and his party appear more ambivalent. Warsaw is obliged to eventually join the euro under its terms of accession, and while the current government has merely moved the date back, Duda has actively attacked the troubled currency, as well as other EU policies. “We shouldn’t agree with decarbonization which is devastating to Polish energy industry or to hurry with joining eurozone as it will lead to drastic prices increases,” he said during his campaign, in which he also produced a video about a family struggling to buy food in a future eurozone Poland. Although Duda is unlikely likely to revert to the disruptive anti-Berlin rants of the Kaczynskis, Poland’s relationship with Angela Merkel, carefully rebuilt by Civic Platform, could be tested. On Ukraine, the dominant international issue for Poland in the past year, Duda and Komorowski have been outdoing each other in showing their loyalty to Kiev. The president elect has called not only for EU membership for Ukraine, but also military assistance in fighting the rebel republics in the east of the country. Despite Moscow’s attempts to forge informal alliances with Euroskeptic politicians of all persuasions in recent years, the Kremlin is likely to take a dim view of a Polish leader ratcheting up the tension in what is already a mistrustful relationship. Yet, with most aspects of Duda’s future administration, and even his public persona, for the present there can only be conjecture. The decisive factor is likely to be the election for the Sejm, Poland’s lower house of parliament, which will either give of Duda a free hand to pursue his agenda with the help of Law and Justice leader Jaroslaw Kaczynski, or leave the new president moored in a more symbolic and contained role, following a renewed Civic Platform mandate.